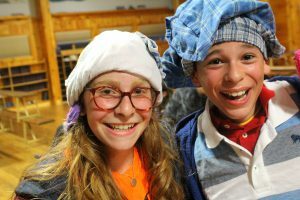 We have had quite a few exciting days here at Machaneh Yavneh! On Tuesday night, the camp had KTV, or Kerem TV. At that event, each tzrif (bunk) performs a lip syncing skit to a song in a particular category. Kfirim’s category was Broadway musicals. Everyone performed really well. G6 came in second place and B9 came i n first! Kol Hakavod Older Kfirim! Then, on Wednesday, we went on our overnight camping trip. Older Kfirim went with Aliza to White Lake State Park, and Younger Kfirim went with Micah to Pawtuckaway State Park. At both locations, thechanichim (campers) went on a nature walk and swam in the lake. They had a barbecue and finished off the night with S’mores around the campfire, followed by sleeping soundly in their tents. Tonight is the annual rikudiah (dance festival) where the banim (boys) and banot (girls) each perform a dance, and with Friday comes Shabbat.